Spacious and open plan, Macquarie Shores Manufactured Home Estate is a slice of tranquility in the heart of the growing Central Coast. Only 50 easy minutes from Hornsby and 35 minutes from Charlestown we offer quality living for the over 50’s on the Central Coast. Close to major new shopping centres, RSL, bowls and golf clubs and hospital, our central location, quiet settings and on-site facilities ensures you retain full independence with access to the security, companionship, facilities and services of a senior living community. Our village offers a wide variety of recreational and social activities with the peace of mind of high security, low maintenance living, and caring owners and management. Our aim is for you to enjoy a quality lifestyle, in the company of people of similar age, without the worries of high maintenance and financially draining living. 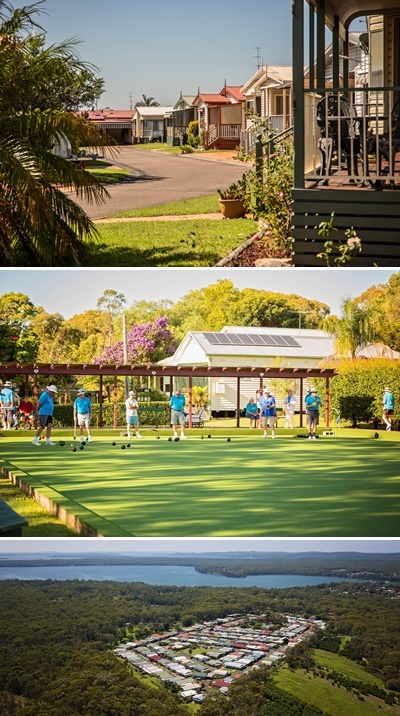 Self-care housing estates for seniors provide a wide range of services, facilities and lifestyle choices, including leisure and recreational opportunities, that are not restricted to define “retirement villages” but extend to communities united by age and need. Come and see how pleasant life can be. We welcome you to inspect our village, we are sure you will be pleasantly surprised. Morpeth Gardens is locally owned and operated modern affordable lifestyle in the beautiful lower Hunter region, bordering the township of Morpeth. At Morpeth Gardens it is our vision to develop & construct an eco-friendly, serene and secure lifestyle village, with the latest modern facilities, to suit your personal needs. Morpeth Gardens is just two hours drive north of Sydney, 15 minutes to Maitland Railway Station, and 30 minutes drive to Newcastle Airport. Free standing architecturally designed 1, 2 and 3 bedroom homes, or custom designed to suit your needs. You can select from our range of architecturally designed homes, or we can design and construct to suit your individual needs. Our experts will advise you through the design journey, every step of the way, and prioritise the sustainability and affordability of your new home. At Morpeth Gardens we are the builder. We are now offering homes starting from $285, 000 complete with everything from air conditioning to landscape gardens. Our first display home will be completed in August 2018. Please do not hesitate to contact our friendly team about any queries or questions you may have. We look forward to hearing from you.